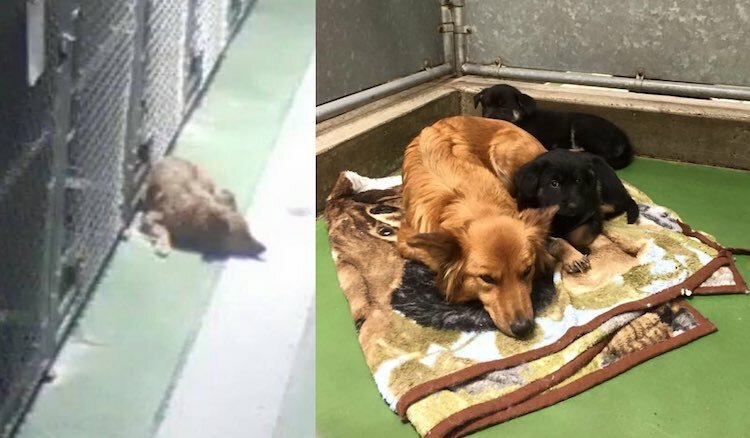 When a pair of foster puppies started barking on their first night in a new kennel, one of the dogs that was boarding nearby decided to adopt them. The pups were restless in their new surroundings when Maggie, an Australian Shepherd mix whose family had been boarding her at the kennel for about a week–and her maternal instincts took over. The owners of Barker’s Pet Motel and Grooming in Alberta, Canada watched on security cameras as Maggie, a mama whose litter of pups were recently adopted, sneaked out of her own pen to comfort them. When someone went in to check on the dogs, Maggie got in the pen with the pups and was able to calm them right away.